George, the ‘city for all seasons’, is nestled in the heart of the Southern Cape’s picturesque Garden Route. We spoke to the dynamic manager of SVL’s branch in George, Lusia Coetzee, about her branch’s operations and some unique characteristics of the region. As one of Stuttaford Van Lines’ 13 branches across Southern Africa, SVL George is ably supported by the brand’s national network. The George branch is staffed by four full-time administrative and sales staff, including Branch Manager Lusia Coetzee, and has one dedicated driver with additional packers and porters on-site. Considering that the branch is responsible for a region stretching from Swellendam in the West to Storms River in the East, and up to Beaufort West in the North, it is no wonder that Lusia says that she is always on the road meeting with clients! In addition to her responsibilities with SVL, Lusia also represents the broader removals industry as the Vice Chairperson for the Professional Movers’ Association (PMA) in the Eastern Cape. She joined the industry in 1989 in an administrative role at a removals company in Bloemfontein, and was appointed as the Branch Manager for SVL George in August 2010. December 2015 will be special, as it marks her 20th year of service to the brand’s parent company! She says that she sees her position as a female branch manager – still rare in the removals industry – as both an honour and an unexpected advantage. Housewives often end up overseeing families’ removals, and Lusia explains that it’s easier for women to associate with her in their homes. 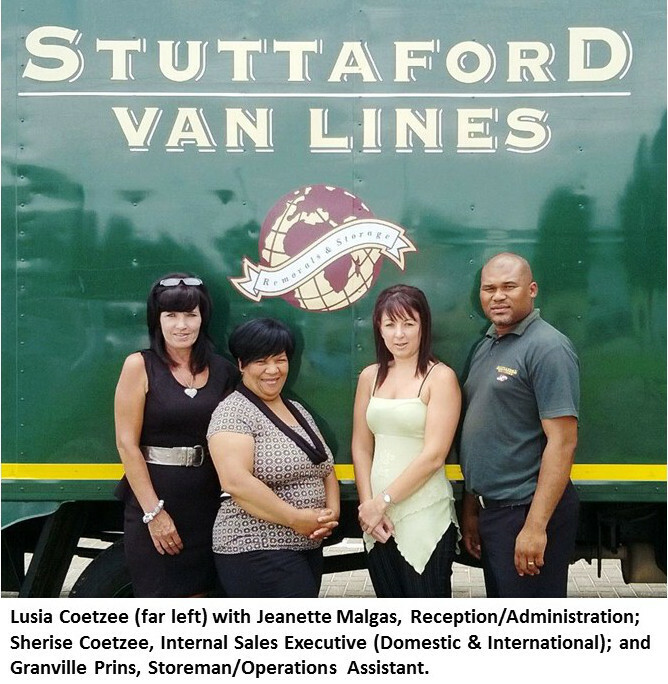 According to her, Stuttaford Van Lines is one of only two removal companies with a physical presence in George. Due to the nature of the market the majority of removals SVL George performs are for private residential clients, but the branch also serves large corporate clients like PetroSA, Eskom and premier golf courses in the region. It still finds time to also assist the local community, however, as was the case when SVL George answered KFM’s recent call for assistance. This saw the branch delivering furniture and other donations collected in Cape Town to George, for a safe house of George Child Welfare in Blanco.